Open to works of any media, any genre/style, any size... One work will be selected for the award, featured in the gallery, and published. Ten semi-finalist works will also be recognized and published. In 2015 we were excited to announce that our non-profit board of directors approved an increase in the annual Manifest Prize (ONE) award amount to to $5,000. This underscores our organization's strong desire to reward, showcase, celebrate, and document the most exceptional artwork being made today, and to do this in a tasteful non-commercial public context. Further, it is to incentivize the creation of excellent work. Manifest's mission is centered on championing the importance of quality in visual art. This project is one aspect of the realization of that mission. There are no restrictions on submissions to The Manifest Prize except that works submitted must have been completed within the past five years (2013-2018). Artists and works which have been included in previous Manifest projects are also welcome and encouraged to submit to the Manifest Prize. We respect the creative principle of reduction (the competitive peer-review jury process) as it is employed to achieve an essential conclusive statement for each exhibit we produce. This is what has led to the high caliber of each Manifest exhibition, and to the gallery's strong reputation. With this principle of reduction in mind, we have been inspired by the intensity of jury after jury to narrow down a collection of entries to a suitable exhibit. Therefore for the Manifest Prize we have determined to push the process to the ultimate limit—from among many to select ONE work to be exhibited in one of our five galleries* for the period of four weeks. This work will be the recipient of the MANIFEST PRIZE, a cash award of $5,000 to the artist of a single work selected by our rigorous multi-member jury process, and presented in a gallery all to itself as the highlight of the competitive process, an honor to the artist, and a poignant statement for gallery visitors. * Final space assignment will be determined by Manifest once finalist is selected. The Manifest Prize was launched in 2010 as an annual offering. The cash award for this competition is now $5000 and a four-week solo exhibit of the single winning work displayed along with juror and artist statements. Ten semi-finalist works will also be included in the season-documenting publication, the Manifest Exhibition Annual. IMPORTANT! Works submitted MUST be available for the exhibition period of early December through mid-January in order to be eligible for the prize. Submission constitutes a formal agreement to provide the work for exhibit should it be selected. Manifest will abide by all tax requirements in disbursing prize money. Media: Open to any and all traditional and non-traditional visual arts genre and media, (including video, photography, sculpture, installation, painting, drawing, etc.). There is no size limit or minimum size required, other than what is capable of being displayed in our gallery space. It would be a mistake to assume that just because the work will occupy a gallery by itself that it must be substantially large. Past Manifest Prize winners have been both very small (15" or so) and room-sized. Size is not a criteria for our jury. Gallery floor plan can be downloaded here. Jury and Curator: Manifest's normal selection process involves a complex two-part system. This exhibit will be juried by an anonymous 7-15+ person volunteer panel of professional and academic advisors from across the U.S. and beyond with a broad range of expertise. Because of the nature of this project, works approved by the first jury will be passed through a second, and possibly a third jury round, with jurors being shuffled from round to round. The work receiving the highest average score will be awarded the prize. The ten next highest scoring works will be the semi-finalists (runners up). 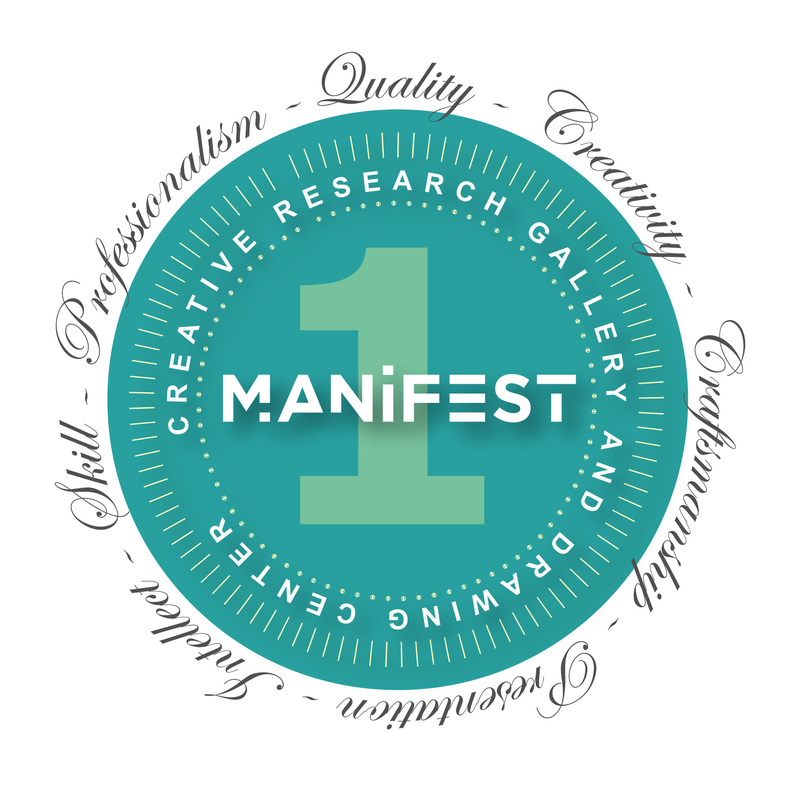 Selected juror comments will be posted in the gallery and in the Manifest Exhibition Annual. Publication: Through nine seasons Manifest Press produced 74 full-color catalogs documenting the works selected for every exhibit presented in our galleries. Starting with season 10 (fall of 2013) we shifted to the design of one much larger high quality hard-cover publication documenting each entire season of exhibits, artists, and works shown. This continues Manifest's commitment to long-term documentation and dissemination of our projects, and the expansion of physical exhibits into a broader geography and time frame, while also bringing all exhibits together under one cover each year to create a better product which will be more valuable to the public, teachers, libraries, and exhibiting artists. The book is larger in size than our INDA, INPA, and INPHA publications, and will be designed, printed, and distributed with the same quality and attention to detail. This does not replace those media specific exhibits-in-print, rather it complements them, and we think rounds out Manifest Press's publication suite nicely. As with all solo exhibitors, the winner of the Manifest Prize will receive their copy of the large-format hardcover book for free once it is produced. The publication will be designed and printed within the first quarter of the following season, and expected to ship by the following January. (Manifest's exhibit season runs September to September each year. The previous MEA books are currently in production, but by the end of this season (our 15th) our production timeframe is expected to be caught up. Our publication production timeframes can vary significantly due to the nature of our small nonprofit staff. But we always deliver quality work. Delivery and Return of Work: All work accepted for the exhibition must arrive ready to install. Works not gallery-ready, or not exhibiting good craftsmanship, may be omitted from the exhibit. Accepted work that differs significantly from the entry images or suffers from poor presentation, will be disqualified. Please note that professional-level presentation and craftsmanship is a must. Work may be hand delivered or shipped. Shipped works must be sent in an easily reusable container/packaging with return shipping prepaid. Works will be returned in the same manner as delivered or via UPS/USPS. All work must arrive at Manifest by the specified date (see calendar below). Accepted work will remain on display for the duration of the exhibition. Works not claimed within 30 days of the end of the exhibit will become the property of Manifest. The artists are responsible for all shipping costs to and from the gallery. Calendar: (Due to the year-long nature of this call the calendar is subject to change slightly. Any significant changes will be updated here, and communicated to all entrants via email). Deadline for receipt of entries, grace period added through this date. ** note that our notification emails are sometimes not received due to aggressive filtering by email servers on the recipient side. For this reason we also post the results of the jury on the exhibits page of the website soon after sending the notifications (within a few days). We encourage all entrants to white list (or allow) email from the manifestgallery.org domain to help ensure our communications arrive. Manifest is a 501(c)(3) non-profit and state-funded charitable organization operated by artists, for artists, with no substantial reserve or endowment. All proceeds from entry fees fund project-related expenses. Not unlike paying a fee to enter a marathon race, this democratically enables our organization's projects to happen. For a decade and a half Manifest has earned an international reputation for producing quality exhibits, and benefitting the artists involved over time, on its meager budget. Our board of directors and small team of dedicated staff work hard to make involvement with Manifest projects well worth the effort and cost to do so. It is important to note that this jury fee is the only cost charged by Manifest for participation. The average number of works submitted to typical Manifest calls is between 3 and 4. Some artists like to submit several more, especially if they have a couple different bodies of work which they'd like our jury to consider, or if they have a suite of works that are interrelated. While we have absolutely no minimum number required (other than one), nor do we give an advantage to those who submit more, it is helpful to have some options to select from. Our jury often gains insight into one work by seeing it in context with others by the same artist. Even for this project, having the option to consider from among many choices will be helpful. Having multiple works by one artist, each with high scores, can also be helpful with solving any ties between artists. Sale of Work: All work, unless indicated as not for sale (NFS), will be available for sale during exhibit. Manifest Gallery will retain a commission of 30% on all artwork sold during the exhibition. Submission Images: In an effort to conserve resources Manifest accepts only digital images/files for consideration. See specifications below. The Gallery will retain the submitted images of accepted artwork and reserves the right to use the images in publications and gallery publicity. CD's of works not selected will only be returned if accompanied by a SASE. Digital Format: Digital images can be submitted on disc or by e-mail (send to: show@manifestgallery.org). The email and online submission process is HIGHLY PREFERRED because it makes our process more efficient and saves postage and materials for the artists. Hi-Res, print-quality images will be requested for accepted works upon conclusion of the jury process. If suitable images are not provided, the work may not be included in the Season publication. All entry files (regardless of type or media, including VIDEO) must be named with artist's last name (underscore) first name, followed by the entry number as noted on the entry form (i.e. Jones_Mike_1.jpg). Please DO NOT include any other information in the file name, such as title of work, etc. Detail info should NOT be included on the entry form. The image files should be in HIGH QUALITY JPEG format, images should be no smaller than 1000 pixels in any direction (about 13”) and 72dpi. This should result in most image files ranging from 700kb to 2mb in file size. Entry images should not be larger than about 2mb. Video links should be provided on the entry form for each work in the VIEWING LINK or NOTES section, and should link directly to online or downloadable content that does NOT require a login, password or membership to view. These may be in the form of Youtube, Vimeo, Dropbox, or other similar links. Effort should be made to eliminate confusion or extraneous information that may interfere with the jury's viewing of the work. Any extraneous information, or material not considered to be 'the work' will inevitably detract from the jury score for that work. Submitting the entry form indicates that you agree with the conditions of entry and exhibit as outlined in this prospectus, that you are reserving spots in our jury, that you will send the entry fee, and that you agree to make your work available and will ship/deliver it to the gallery on time should it be selected for exhibit.